The upshot of these differing opinions is that Jacobson is now seeking $10 million in damages from Clack and his publisher, claiming that he has been defamed. You may have never heard of Jacobson or Clack, but this lawsuit has important political implications. This is an alarming situation at several levels. First, this lawsuit is an attempt to use legal action to suppress scientific discussion, even if the lawsuit is ultimately decided in Clack’s favor. Second, the lawsuit demonstrates contempt for the issues involved. Just because Jacobson’s legal case seems weak, we can’t just assume that we don’t have to worry about this. in the current chaotic political environment, no one can know whether this lawsuit might actually succeed. Even if it doesn’t succeed, it can do immense damage. The cattle industry launched an essentially frivolous lawsuit against Howard Lyman and Oprah Winfrey because of statements they made on Oprah’s show in 1995, which the cattle people said disparaged beef. Lyman and Winfrey ultimately won, but it took years and years of effort, a trial, and a vast outlay of expenses. No matter what the outcome of Jacobson’s lawsuit, the accompanying negative publicity could boomerang into negative images of climate scientists generally. The lawsuit is also disturbing because it demonstrates contempt for the issues. It’s as if doubts about renewables are not worthy of scientific discussion. Many prominent people and organizations are relying on Jacobson’s ideas — most obviously “The Solutions Project,” but also most mainstream climate action organizations (e. g. 350.org) and liberal climate-aware leaders like Hillary Clinton, Bernie Sanders, and even Jill Stein of the Green Party. Both political leaders and climate activists are assuming that making the switch to renewables doesn’t pose fundamental challenges. This is a dangerous assumption. Clack’s critique could have gone a lot further. It doesn’t mention many other key problems with renewables. Renewables often require “rare earth” minerals, which are themselves in short supply. Renewables (and nuclear energy too, which avoids other problems with renewables) produce only electricity, but our cars and trucks rely on oil. Renewables require a huge expansion of the electric grid to carry all this electricity. 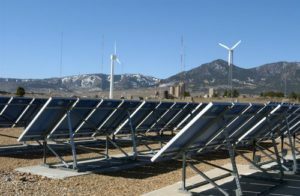 The transition to build and support a renewable infrastructure will take a huge bite out of resources now devoted to the consumer economy. And what about livestock agriculture? Even a 100% renewable energy economy wouldn’t fully deal with climate change. The impact of livestock and our biological disruption of the biosphere is comparable in scope to our massive use of fossil fuels. There is little chance of dealing with climate change (or mass extinctions, or soil erosion, or other critical environmental problems) without also sharply reducing or eliminating livestock agriculture. We need to be honest about what is involved. Effective climate change action will be much more difficult than Jacobson and many others assume. It will require the total mobilization of society. If political leaders and climate organizations want our support, they are going to have to do better than to offer platitudes about climate change. They need to convince us that they understand the depth of the changes we need. If they still think that 100% renewables are easily achievable anyway, fine: let’s hear your arguments. But lawsuits cannot be a substitute for real discussion. UPDATE Feb. 25, 2018: Mark Jacobson has now withdrawn his lawsuit. Jacobson gave an explanation of his actions and said he was withdrawing the suit due to the “enormous” cost of continuing it.